There is so much disinformation out there it boggles the mind. Canines are all pack animals. All canines are “denners”. This means that left to their own devices, they will seek out places to sleep and rest that provide close cover and protection, not only from the elements, but from their enemies. Greyhounds, unlike most domestic canines, are raised in a pack. As puppies and then as saplings, that pack is comprised of their litter mates and/or other greyhounds their age who are being raised on the facility where they reside. When they arrive at the racing kennel as young adults, they become members of a larger pack, with sub-packs. Each pack member in the racing kennel has his/her own “den”, which we (and those companies who sell them commercially) refer to as crates, and propagandists prefer to call “cages”, for maximum, negative connotation. Canines have been observed, ad infinitum, to sleep anywhere from 12-16 hours per day, both in domesticity and in the wild. That is perfectly normal behavior for canines of almost any stripe. 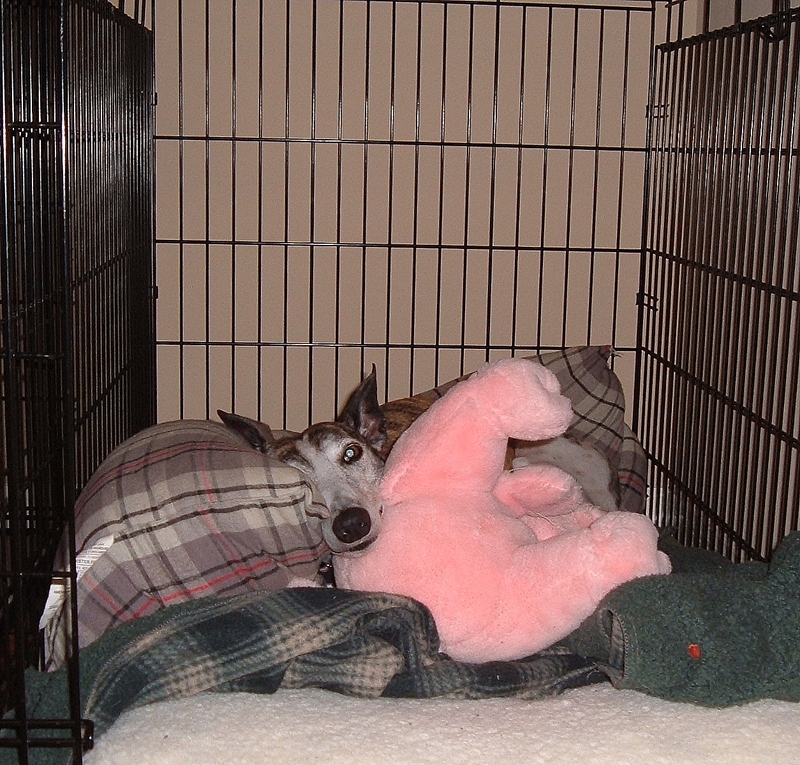 Greyhounds, whether in a racing kennel or kept as pets in the home, are notoriously fond of sleeping for protracted periods of time, and for huge portions of the day. That’s why they are known by all and sundry, affectionately indeed, as the infamous “40 mile per hour couch potato”. After a brief period of adjustment and evaluation, once they begin their racing careers, greyhounds are kept on a program of vigorous exercise, training, handling and grooming. They gallop in long runs, or on the racetrack itself. They are schooled behind the lure. They are walked on walking machines or by hand, and sometimes they even swim at facilities that have nearby lakes or other bodies of water that the trainer and the dogs can make use of. They take whirlpool baths and/or receive relaxing massages, and they are brushed, combed, pedicured and slicked up before and after racing or training sessions. They are kept busy, and at all times, share their lives with their pack members. In all cases, conditioning them to race successfully takes time, repetition, commitment, and more than anything, it takes a lot out of the greyhound. Greyhounds cherish and require their downtime, their rest and their relaxation, to recover from the exertions of playing, training and then, racing. They don’t develop their highest-muscle-to-bone ratio in the canine world through lack of exercise or by being sleep-deprived. Those of us who have never seen a greyhound immediately after a race or a training session behind the lure, have no idea just how much effort and energy they expend getting after it. Until you see the pumped up muscles, almost appearing to bulge through the greyhound’s skin, the heaving sides, and the expression of pleasant fatigue and satisfaction on the face of the dog, it is impossible to imagine the degree of their desire, satisfaction and commitment. Once you witness it, it all becomes perfectly clear. The amount of sleeping and lolling about they do is roughly a reflection of the depth of their natural and healthy expressions of their genetic and athletic heritage. So that couch potato you have at home, blissfully snoozing the day away as you occasionally check in to see if he or she is still alive, was, before he met you, a 40 mile per hour “crate potato” in the racing kennel. He learned to rest and snooze in his own private den space, feeling perfectly secure, while the kennel was a virtual beehive of activity all day long. He was deprived of nothing, was anything but bored, and was perfectly thrilled and willing, when his name was called for either walking, galloping, schooling or racing—or just about anything other than nail-trimming.